Are you looking for self storage in ChicagoÃ¢â‚¬Ëœs Wrigleyville neighborhood? Well, we have good news for you! Zippy Shell moving containers provide the perfect solution! Zippy Shell will deliver a moving container right to your home. You pack it. We pick it up. Itâ€™s that easy! Weâ€™ll take your belongings to our safe, secure, climate-controlled storage facility where theyâ€™ll be kept safe and clean until you need them back. Zippy Shell attends Cubs opening day 2014! Portable Storage Delivered to Your Door! Portable storage makes perfect sense for a busy, beautiful, dynamic neighborhood like Wrigleyville. But when it comes to getting in, out and around, things can get difficultâ€¦ Especially on moving day! Zippy Shell take the stress out of moving by offering a mobile storage solution. Our moving containers are the only ones in the city of Chicago that are street-legal! This means that we can park our moving container in front of your residence! 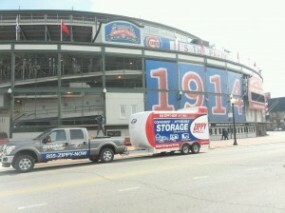 No other moving service in Wrigleyville can do that! Your Zippy Shell will be kept safe and secure until you are ready to receive it again. Simply tell us where to deliver your shell and we will bring it to your new address. Your belongings will be packed exactly as you left them. How easy is that? Once we deliver a Zippy Shell, moving can be done at your own pace. You can pack as much as you like Ã¢â‚¬" simply let us know when youâ€™re done so we can collect it. Forget about renting moving trucks. Forget about fighting Cubs traffic to get to your self storage space. We take the hard work out of storage. And when youâ€™re ready to get your stuff back, weâ€™ll deliver it straight back to your door as well! Simply compare Zippy Shellâ€™s pricing to any other moving service in Wrigleyville and youâ€™ll soon see why we are the fastest growing Chicago storage service! Affordable self storage in Wrigleyville has a new name Ã¢â‚¬" Zippy Shell! For a free quote or to find out more, simply use the FREE QUOTE form on this page, or call us on 855-947-7966. We are open from 8am to 9pm. Zippy Shell in Wrigleyville can help make your next move a snap! And there is simply no better solution for affordable self storage! Contact us now.